You’ll feel the magic of Santa Fe, New Mexico, as soon as you step into the historic city. Captivate your senses with its sights, sounds, and feel. The classic adobe architecture is contrasted against the distant mountains that beckon you to come explore. The aroma of spicy chilis and sweet desserts rise up from every restaurant. Santa Fe’s energy is magnified by the people coming in and out of the art galleries, browsing the markets, and sampling the cuisine. Come experience it all with your other half when you embark on Santa Fe romantic getaways. Santa Fe romantic getaways have the opportunity to be full of adventure. With the perfect balance of desert and mountains scattered with rocks and greenery, you will love exploring as a couple. Throw on some sneakers and take a few hours to make the trek up the Atalaya Mountain Hiking Trail. At an elevation of over 2,000 feet, this scenic overlook has the best views of the city below. After your hike up, sit back, relax, and revel in the incredible landscape with your sweetheart. See Santa Fe like you have never seen it before! Exploring Santa Fe on horseback is the perfect way to see the beautiful outdoors while not partaking in an activity as strenuous as a hike. Choose from a variety of ranches offering horseback riding for your perfect experience. For an especially romantic excursion, choose a sunset ride. Enjoy the serenity as you travel through nature toward the golden glow of the sky. As the sun sinks down to the horizon, head back to the ranch and end your journey with the rays of sun streaming across the atmosphere. Santa Fe is packed full of history and art. Spend some quality time with your partner when you learn about it together at one of the many museums, galleries, or historic sites. You’ll find numerous galleries lining the streets of downtown, but one of the most famous is the Georgia O’Keeffe Museum. Here, you’ll find the single largest collection of the Mother of American Modernism’s works. After touring the museum, stroll hand-in-hand down the historic streets of downtown to admire the past of the beautiful city. When planning Santa Fe romantic getaways, the most important thing is to choose the right place to stay. 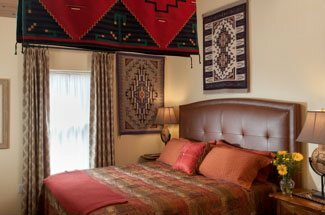 Four Kachinas is the perfect place for a romantic vacation. Choose from luxurious rooms, many of which have private entrances and patios. Santa Fe romantic getaways need extras like wine and chocolates, and Four Kachinas can do just that. Indulge in our Santa Fe Special Treatment add-ons for items like champagne and flowers to be delivered straight to your room. Spend the night in with your other half sipping wine on your private patio, or go out on the town for a romantic dinner. Our bed and breakfast is just minutes away from numerous fine restaurants, galleries, retail shops and historic sites. 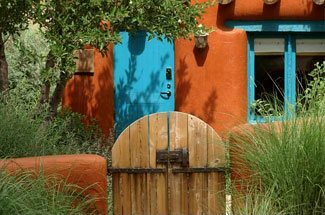 If you need any help planning your Santa Fe romantic getaways, our knowledgeable innkeeper is here to help. We look forward to seeing you in Santa Fe; book now, and start planning!